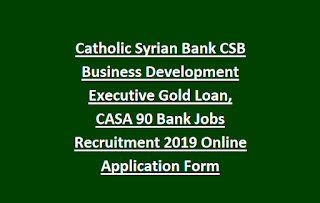 CSB Business Development Executive Gold Loan/ CASA 90 Bank Jobs Recruitment 2019 Application Form,Business Development Executive (Gold Loan/CASA) Bank Jobs in Catholic Syrian Bank (CSB) Notification 2019,Govt Jobs in CSB for Business Development Executive (Gold Loan/CASA) Posts. (Gold Loan/CASA) Posts at various locations of India. Eligible applicants apply now at CSB Careers. They required minimum 6 Months to 2 Years Experience for CSB Business Development Executive (Gold Loan/CASA) Posts. Interested Candidates can apply Offline for CSB Gold Loan Vacancies. Last date update will be soon. For more information refer the official website csb.co.in for CSB Gold Loan and CASA Jobs Recruitment. More details Like CSB Jobs, Selection Process, Important Dates, Qualification, Salary and e.t.c. are given below. Jobs in CSB for Business Development Executive (Gold Loan/CASA) Posts. 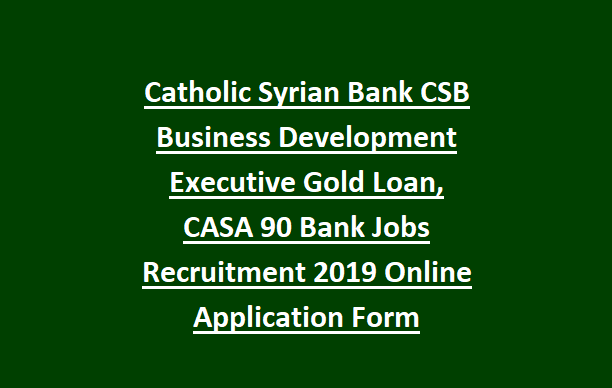 Starting Date to apply for CSB Business Development Executive (Gold Loan/CASA) jobs: 19-03-2019. Ending Date to apply for CSB Business Development Executive (Gold Loan/CASA) jobs: Update will be soon. Total 90 Posts are available in CSB. 1.Business Development Executive (Gold Loan)- 40 Jobs. 2.Business Development Executive (CASA)- 50 Jobs. For location wise vacancies refer notification or online careers link. Refer the official website csb.co.in for Age limits. Degree with Minimum 6 Months to 2 Years Experience. Interview and documents verification. Preference will be given to the experienced candidates. Apply online at csb.co.in. as early as possible before filling the vacancies by some other one.